Trecento in Manuka is the latest Italian restaurant to open, offering woodfired pizzas made from a 300 year old Naples recipe, plus modern, sophisticated starters and pastas. We dined on a Saturday at lunch, and shared each of the dishes. First up was the capesante ($19), seared scallops with cauliflower puree, pancetta and caviar. Oh my. The scallops were perfectly cooked – plump and tender, and the flavour pairings of the pancetta, puree and caviar were creamy, salty and delictible. I will be back for this dish. 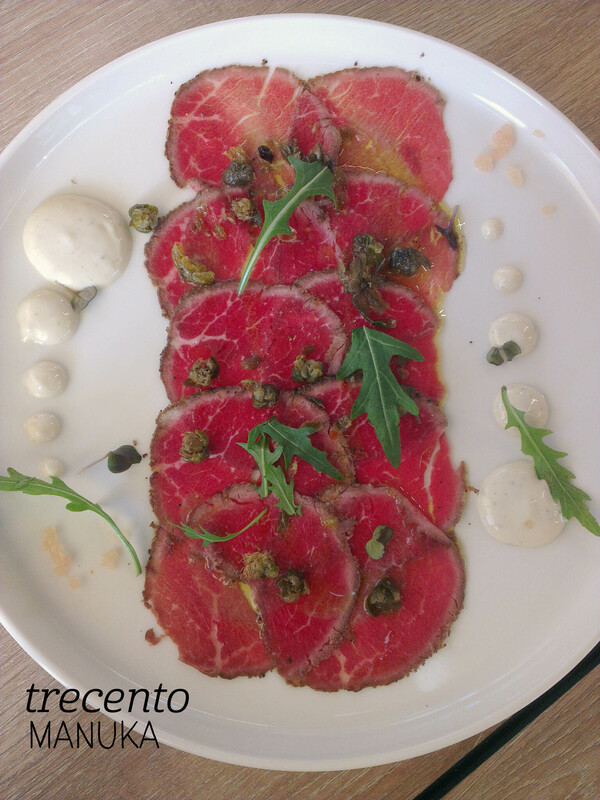 Next was the beef carpaccio ($18) with capers and an anchovy emulsion. I was surprised by the amount of beef, and loved the flavour pairings again – spot on. We had to try both pasta and pizza, so went with the spaghetti al pomodoro ($17) and the napoletana ($22) respectively. The pasta, with fresh tomato and truffle oil, was delightfully simple and tasty, and my friend’s favourite dish. The pizza was as good as promised – thin, crisp base, smoky woodfired flavour, and sparse, quality toppings (hello dairy free pizza! Yay!). We indulged and finished with the dolcezza ($16), a dessert pizza with Nutella, pistachio and icing sugar. Mmm. Can’t wait to come back and try more of the menu. There’s nothing like a good burger, and when colleagues suggested a weekday lunch outing to Patissez in Manuka, who was I to complain? The staff accommodated our large group well and luckily the weather held out. I decided to go for the KFC (Katsu fried chicken) burger, with cabbage and daikon slaw, kewpie mayo and katsu sauce ($18). The food came out in good time considering the size of the group, and the burger was served in a tray witha good helping of fries and a pot of aioli. The burger had a slightly firmer bun than I prefer (the bread was very filling), but the katsu chicken was a real winner, crisp on the outside and not overly crumbed, and soft and tender on the inside – cooked to perfection. The slaw had a nice mix of fresh cabbage and pickled daikon, so there was a good vinegary element from the pickle, plus the delightful creaminess of the kewpie. The katsu sauce was a bit different to the ones I’m used to from Japan (lighter in colour and a little more like curry than I expected) but was still tasty. The fries were just a tad dry for my taste, and the serving a bit big, but overall it was a great mid-week lunch. We ate so much at Lazy Su I’m not going to give a preamble, beyond ‘please go and eat there, the food is amazing’. First up was the yellowfin tuna tataki ($21), which was a small serve but had high quality, tender, plump tuna crusted in spices and served with wasabi. I could have eaten four plates of this and still wanted more. Dish 2 was the Ganjang fried chicken ($13), with three large pieces perfectly fried with a nice, not-too-thick batter and served with two beautiful dipping sauces, plus pickled veggies (mostly caluiflower). The chicken was so tender inside and the aioli in particular was super more-ish. 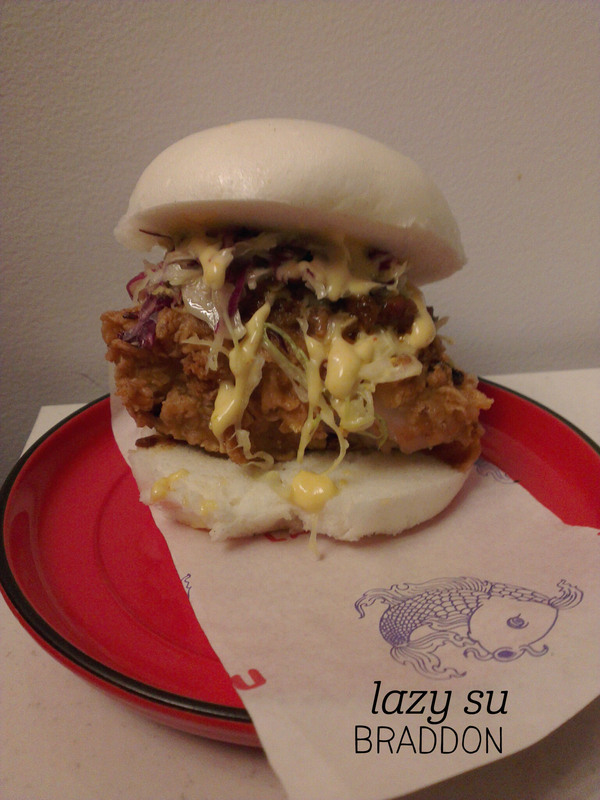 Dish 3 was the chicken tonkatsu bao-ger (bao cross burger, $10) – obviously I went OTT on the fried chicken. 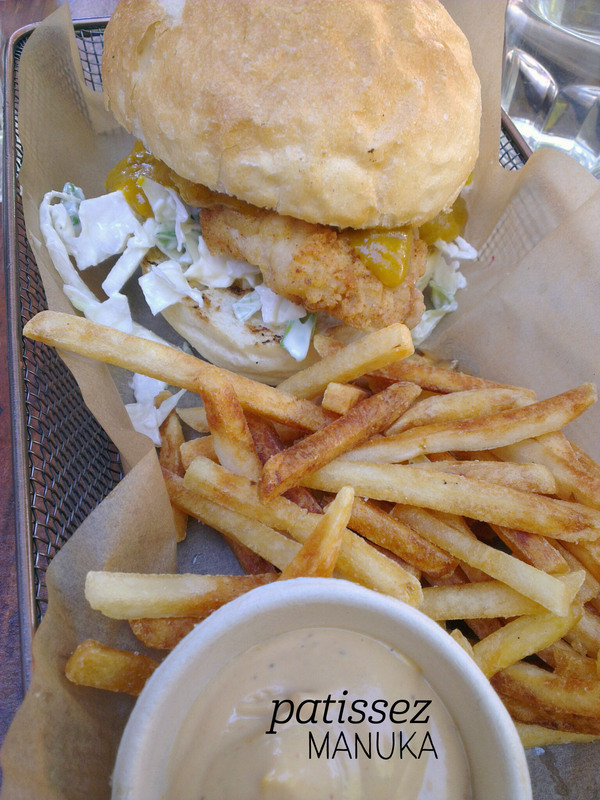 Same quality as the full portion, but with extra aioli and slaw. The bun was fresh and soft, but I found this very filling (great value). We saved the best for last – hello “Bossam” noodle soup ($18), with 12-hour pork broth, pork belly, soy egg, pak choy and noodles. Oh my. 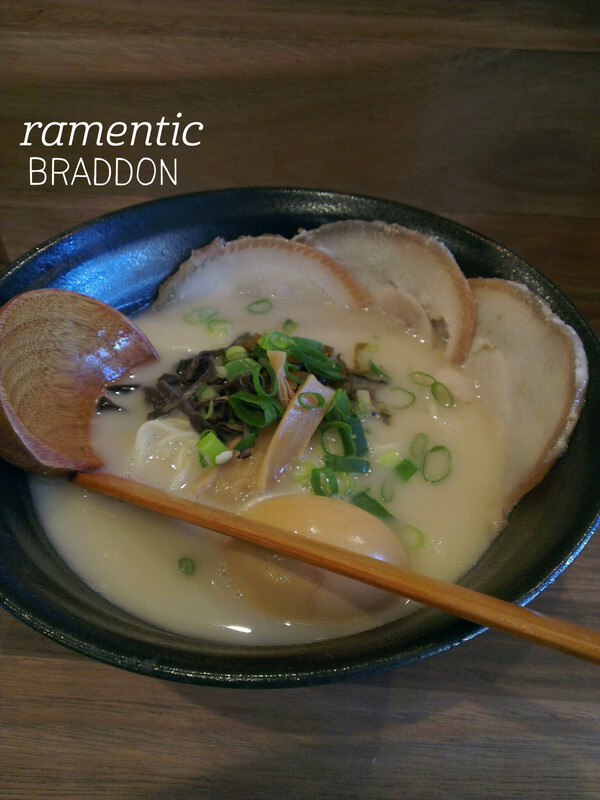 The broth was to die for, with just the right amount of heat and perfectly flaked bits of pork floating in it – the ultimate comfort food. The noodles were cooked to perfection, and you all know how much of a sucker I am for ramen eggs. Heaven. I repeat – please go eat here, the food is amazing. 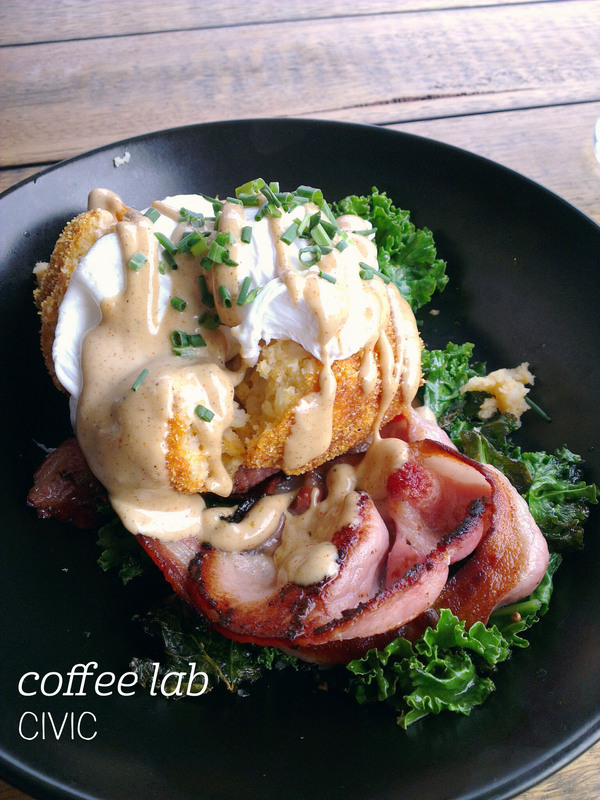 I can’t believe I hadn’t been to Coffee Lab until now – this place is awesome! I met friends and we sat outside in the fresh air. I ordered the ‘No Ragrets’ (sic, $17), with a cornmeal hash brown, kale, poached eggs, Pialligo bacon and James Brown sauce. There was literally nothing about this dish I didn’t like. The hash brown was a creative interpretation, more like a baked potato in shape, and with a slightly grainier texture than a potato version, but still super tasty and filling. The kale was well-seasoned and moreish, while the Pialligo bacon worked its usual magic of making everything taste better. It was cooked with a good balance between crispy and soft. The eggs were perfectly poached, but what really brought the whole thing together was the James Brown sauce – I wonder if they’ll share the recipe with me? This dish brought together all the things I look for in a good breakfast – nothing too heavy, but filling, warming, and with good variety of texture. The menu here has a lot to offer, and I can’t wait to come back and explore it further. 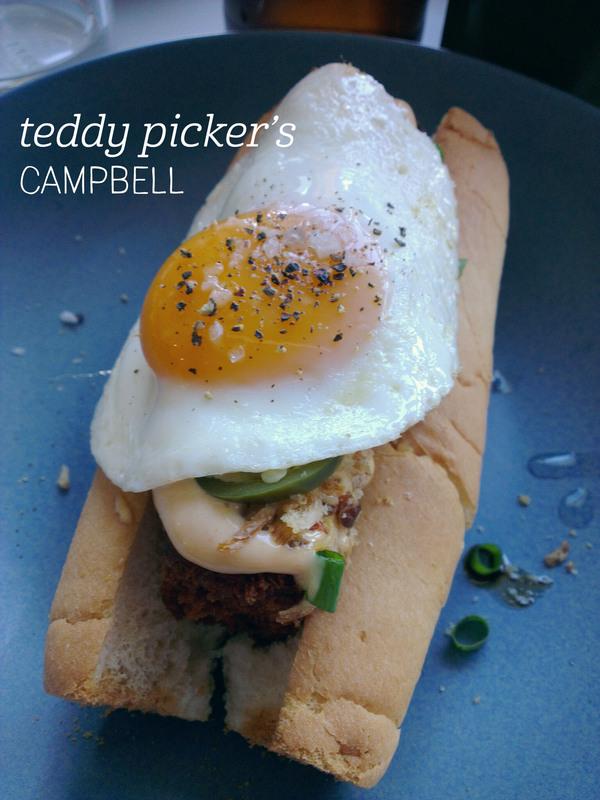 The last time I went to Teddy Picker’s I felt a bit unwell, so didn’t end up ordering my dish of choice – the Brekky Roll ($15) with crumbed brisket, ‘red eye’ mayo, pickled jalapenos shallots and a fried egg – but I rectified the situation this visit. Firstly, what I love about Teddy Picker’s is the non-traditional breakfast options. Sure, other places have more choices, but you’re going to encounter unusual flavours here, which shows their understanding of the Canberra market. The Brekky Roll is a perfect example. No bacon here – the crumbed brisket is fried to crispness on the outside, leaving the meat within tender and moist, so that the overall effect is a texture party in your mouth. I love that the meat is a little bit sweet from the slow cooking, and this works perfectly with the tangy mayo slathered on top. I am a huge fan of the deep fried shallots (so much crunch!) and whilst jalapeno isn’t your typical breakfast accompaniment, the pickled version used here adds so much flavour, I couldn’t imagine the dish without them. My only gripe was that the egg wasn’t positioned to ooze into the roll (it went all over the plate instead, such a waste), but I think I’ll just have to go back and perfect my technique. I love Two Before Ten in Aranda, and was excited to hear they’ve taken over the space that was occupied by 79 & Fine in the city. The decor hasn’t changed much, but the menu is certainly more expansive than its predecessor’s. I ordered a fresh juice, which unfortunately tasted awful, so the staff kindly replaced it with a bottled juice. So it was a disappointing start, but when my breakfast arrived, all was redeemed. 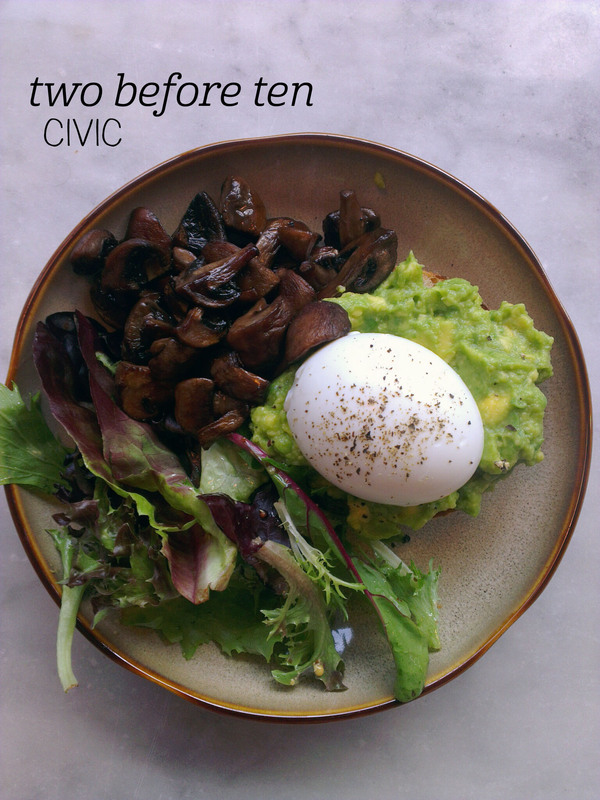 I ordered the Brown Bear ($13) – a boiled egg with avocado and a rye muffin, with mushrooms. The plate was beautifully presented, and my egg, when opened, was cooked to perfection. The salad greens on the side added a hit of fresh, crispness that complemented the other textures nicely. Both the egg and the avocado were nicely seasoned (I do love a good smattering of pepper) and the rye muffin wasn’t too heavy, as I often find rye to be. On the other hand, it wasn’t so light as to not be filling, so the balance was just right. The mushrooms did steal the show a bit – juicy, earthy and salty, I scooped these up with no remorse. A perfect weekday breakfast in town.